As is often the case in the Digital Humanities landscape, outsiders find it difficult to imagine what kind of work a digital medievalist would engage with. If the term Digital Humanities is often perceived as an oxymoron, this is even more so for Digital Medievalist. Digital and medieval do not seem to go together, and yet, as we know, they complement each other in our projects. 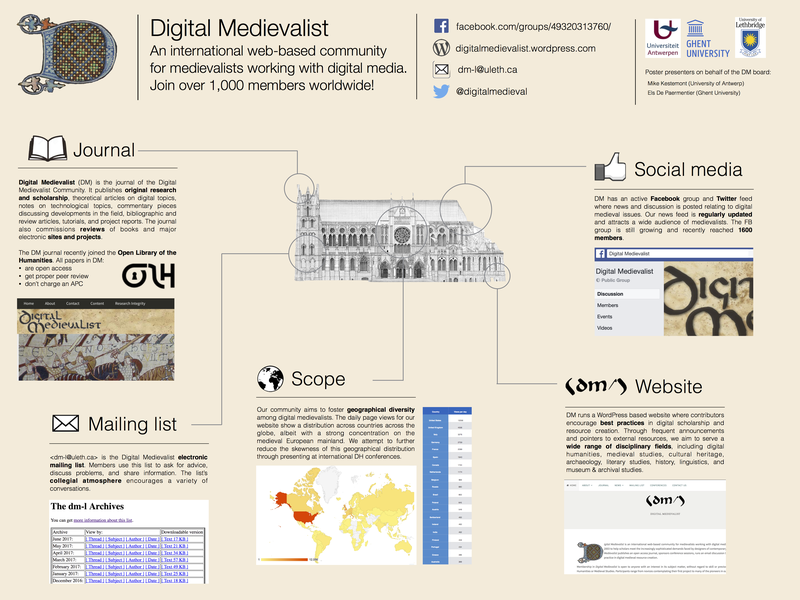 Digital Medievalist (DM) was born in 2003 as a project and an international ‘community of practice’ dedicated to the development and dissemination of best practice in the use of technology in Medieval Studies. In 2005, the Digital Medievalist Journal (DMJ) was added as a more formal component of DM. 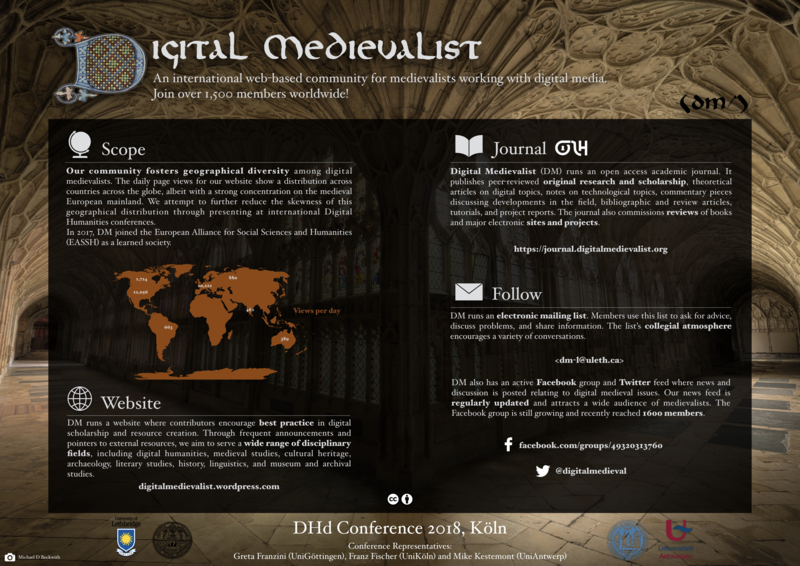 A review of the papers published in DMJ and of the posts and webpages here at digitalmedievalist.org provides an idea and an overview of our scholarly activities. Digital archives, digital palaeography and codicology projects, medieval corpora, textual analysis and editions are among the most prominent activities, but DM does not wish to be solely involved in medieval manuscript culture. A recent review of a project on Gothic Architecture is an example of the breath of activities carried out by digital medievalists. To start a reflection on the scholarly interests and endeavours lead by members of our community, we are launching a series of blog-posts written by digital medievalists from around the world, focussing on some aspects of their research, and showcasing their particular views of the Digital Medievalist landscape. We begin with contributions by a group of early career researchers who are (or have been) engaged in research projects as part of a series of postdocs in Data Curation for Medieval Studies, organized by the Council on Library and Information Resources (CLIR) and funded by the Mellon Foundation. We would like to take this opportunity to encourage other researchers engaged in projects that fall within the umbrella of Digital Medievalist interests to contact us and submit blog-post proposals. Christopher Clarkson (Blackheath, UK 1938 – Oxford, UK 2017) was a distinguished conservator of medieval manuscripts and early printed books, and a thorough bookbinding historian, with a focus on the structural and material history of books from the birth of the codex to the early Renaissance. He trained in design and graphic arts at the Camberwell College of Arts and Crafts (London, UK) and subsequently at the Royal College of Art (London, UK), where, almost by chance, he encountered the art of bookbinding and fine binding and was later taught by Peter Waters. He then went on to work with Anthony Cains at Douglas Cockerell & Son and with Roger Powell, where he deepened his understanding and knowledge about the repair of early printed books and manuscripts. In 1966, he was invited to join the English Government team sent to respond to the cultural heritage emergency resulting from the devastating flood of 4th November in Florence, Italy. It was there that the principles of modern ‘book conservation’ (a phrase coined by Chris himself) were first formulated. These aimed at repairing books with a strong emphasis on the historical and archaeological significance of their materiality and structures, and not just on making the objects usable again or producing historical facsimiles, as was the custom, often in manners non-sympathetic to their materials, structures and historical evidence. Chris went on to work at the Library of Congress (Washington, DC), The Walters Art Museum (Baltimore, MD), and the Bodleian Library (Oxford, UK), where he developed, in collaboration with David Cooper, the system of wedge book-supports now found in rare-book reading rooms worldwide. In 1987, Chris embraced his calling as trainer and mentor of book conservation students and professionals. He moved to the Edward James Foundation at West Dean College (near Chichester, UK) and helped conservators from around the world develop a deeper understanding of the conservation of book materials. He was also involved from the very beginning in the shaping of the European Course in Preservation and Conservation of Book Materials held in Spoleto, Italy, since 1992, where he taught up to the early 2000s. He ran Staff Training programmes at the National Archives and the National Library of Slovenia (Ljubljana), the Bodleian Library, and the Wordsworth Trust at Dove Cottage (Grasmere, UK). He taught at the Rare Book School (USA) and run workshops and seminars in many countries, including Japan and South America. In 2004, Christopher was awarded the Plowden Gold Medal of the Royal Warrant Holders Association in recognition of his invaluable contribution to training and educating conservators worldwide, fostering deep historical awareness of the materiality and structure of the books as objects. In 2012, he was awarded a Doctorate Honoris Causa by the University of the Arts London for his contributions to the history of bookbinding and archaeology of the book. Throughout his career, Chris dedicated his research interests in the study and understanding of historical book materials and bookbinding structures, and medieval binding structures in particular. Book conservation bridges a wide range of disciplines—history, science, engineering—, but also requires high levels of observational skills and craftsmanship. Advocating the close study of period materials and book structures, Chris, through thorough visual and tactile training sessions, taught his students to seek an ever-deeper knowledge of the historical integrity of artefacts. Chris despised facsimile work—he called this ‘the danger of poor conservation training’—for past culture and artefacts cannot (nor should) be recreated by mindlessly applying historical typologies without an understanding of, and respect for, the unicum that each book is. Chris, thus, taught us how to see the object, with its peculiarities and unexpected characteristics: “to train the eye is to train the mind”, as he put it. Understanding historical binding techniques, and the cultural significance of specific material characteristic of books, is a skill that has probably never been as relevant as it is today in our transition to the digital. The teachings of Christopher Clarkson have influenced the new generations of book conservators globally, and for this we are all greatly in his debt, for his principles of conservation, aiming as they are at preserving the essence of each period artefact, safeguard historical material evidence in the collections of memory institutions the world over. Now, this preserved information needs also to be transposed into the digital, and integrated with valuable digitization efforts of library and archive materials. Book conservators have been trained on how to see (and thus understand) period artefacts for their uniqueness: these skills should now also be taught to digital humanists engaged in the translation of our written cultural heritage into the digital medium. If this happens, we will have a more complete representation of the object than we do nowadays, and for this we will also and always be thankful to Chris. Final note: On Monday, 26th June 2017, there will be a memorial for Christopher Clarkson at the University of the Arts London to celebrate his distinguished life with family, colleagues and friends. Unable to participate because of the distance, I would like to pay my respects to Chris with this post. Digital Medievalist will be holding elections at the end of June 2017 for four positions to its Executive Board. Board positions are for 2-year terms and incumbents may be re-elected (for a maximum of three terms in a row). Members of the Board are responsible for the overall direction of the organisation and leading the Digital Medievalist’s many projects and programmes. This is a working board, and so it would be expected that you are willing and able to commit time to helping Digital Medievalist undertake some of its activities, like editing the journal, organising conference sessions, administering website, facebook group and news feeds, or maintaining a technical infrastructure – and there is room for any initiative you would like to take to foster the communication on digital methods in medieval studies. We are now seeking nominations (including self-nominations) for the annual elections. In order to be eligible for election, candidates must be members of Digital Medievalist (membership is conferred simply by subscription to the organisation’s mailing list, dm-l) and have made some demonstrable contribution either to the DM project (e.g. to the mailing list, or the wiki, etc. ), or generally to the field of digital medieval studies. If you are interested in running for these positions or are able to recommend a suitable candidate, please contact the returning officers, Dominique Stutzmann (dominique.stutzmann [at] irht.cnrs.fr) and Lynn Ransom (lransom [at] upenn.edu), who will treat your nomination or enquiries in confidence. The nomination period will close at 23:59 UTC on Thursday, 15 June. Elections will be held by electronic ballot from Thursday, 22 June 2016, closing at 23:59 UTC on Wednesday, 7 July 2016. By some accounts, 1017 marked the advent of the Norman presence in Italy and Sicily, inaugurating a new era of invasion, interaction and integration in the Mediterranean. Whether or not we decide the millennial anniversary is significant, the moment offers an ideal opportunity to explore the story in the south, about a thousand years ago. To what extent did the Normans establish a cross-cultural empire? What can we learn by comparing the impact of the Norman presence in different parts of Europe? What insights are discoverable in comparing local histories of Italy and Sicily with broader historical ideas about transformation, empire and exchange? The conference draws together established, early-career and post-graduate scholars for a joint investigation of the Normans in the South, to explore together the many meetings of cultural, political and religious ideas in the Mediterranean in the central Middle Ages. The three-day conference features 80 speakers from around the world, and three parallel strands of sessions: ‘Conquest and Culture’, ‘Art and Architecture’ and ‘Power and Politics’. Meal bookings optional; conference dinner places limited; early booking strongly recommended.